If you’re looking for a special dance floor with a real impact, prepare to be amazed by our stunning LED starlit dance floor. I can supply professional LED dance floors to any event based in Surrey, Kent, Hampshire and London, specialising in the hire of black starlit and white starlit LED dance floors, guaranteed to give that wow factor a your special event. 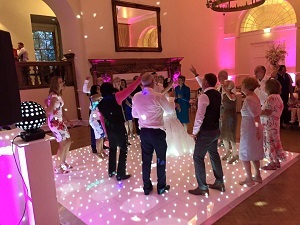 Your guests will be entirely in the dark about what looks like a regular dance floor, until the moment of your choice, when one of many lighting patterns can be activated by remote control, and stunning twinkling stars appear within the floor. Imagine the effect of those beautiful lights coming on for your first dance, special moment or award ceremony! Not only will the dance floor impress every guest in the room, it looks really impressive in photographs too, as the LEDs provide a beautiful clarity of light. They’re safely embedded underneath the surface of each interlocking tile, providing you and your guests with a smooth and safe surface to dance or walk on. Because they’re supplied as individual tiles, you can lay them out however you want – a large square, a long catwalk or on a stage, giving a sophisticated and elegant floor wherever you choose. Give your guests something to talk about, and dazzle them with our stunning LED dance floor. Call us today to find out more.